Round Robin Scheduling assigns a fixed time unit per process and cycles through them. There are different usages of the name Round Robins in computer science, it maps multiple concurrent processes to limited resources. But there are different Round Robin named terminologies exists, so unless it is mentioned after Round Robin, it is possibly pointing towards Round-robin DNS, which is in turn related to load distribution. There are non computer science Round-robin like Round robin test, which is related to medical statistics. In this article, we are talking about Round Robin Scheduling of Operating System. The processes are stored in a queue. The foremost important process is given a time slot to access the resources, then it joins at the end of the queue and the processes all move up one position one by one. The next process is selected by FIFO principle. The process can also voluntarily return the resources before scheduled ending. If a process is completed before the end of its alloted time slot, the resources are immediately reallocated. For operating systems with preemptive multitasking on the scheduler for the active processes, plan an execution in the round-robin method. Then it determines each time slot on a queue and the process that comes next in the series. The dispatcher then divides this process in to one time slot long in the processor. The time to switch is excluded from the sample. The smaller the time slice is chosen, the more context switches are required, i.e., the overhead increases. This time is not suitable for processing the processes. Round-robin treats all processes to be equal, so that on the one hand, no process is being treated unfairly or even starving. This scheduling method is generally neither very low nor very high. 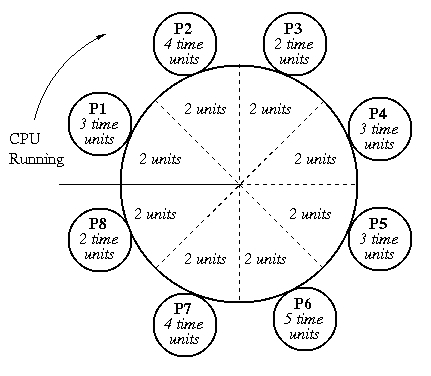 The use of time slots of fixed length makes round robin inflexible and results in unused resources. This Article Has Been Shared 9966 Times! API or Application programming interface is a part of the program from a software system, which is used as token by other programs for connection to the system. General Packet Radio Service or GPRS is the name for the packet-switched service for data transmission in GSM networks. GPRS is based on the GSM. Command Line Interface or CLI is a method that enables the user to instruct a computer program using plain text commands. Concept of CLI, Shell and Terminal Emulator are not the same. Cite this article as: Abhishek Ghosh, "Round Robin Scheduling and Disambiguation of Round Robin," in The Customize Windows, March 30, 2013, April 21, 2019, https://thecustomizewindows.com/2013/03/round-robin-scheduling-and-disambiguation-of-round-robin/.